SENIOR Citizens & KIDS under 6 are FREE. 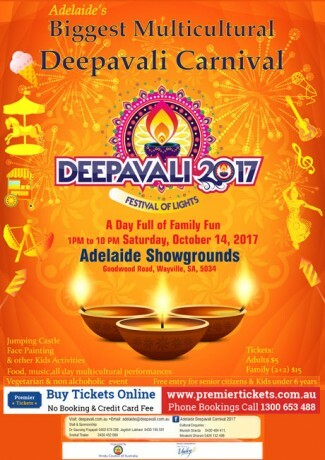 Deepavali Carnival 2017 – SA chapter of Hindu Council of Australia has been celebratingDeepavali since 2015 in association Indian, Nepalese, Bhutanese, Bangladeshi, Tibetan & Fijian communities with great zeal & commitment. Let’s get ready for an awesome entertainment, family fun at the Adelaide’s biggest DeepavaliCarnival 2017. Deepavali Carnival 2017 -The festival is celebrated by Hindus, Sikhs, Jains, and Buddhists for a variety of reasons, although the main theme which runs throughout is the triumph of light over darkness and good over evil. It’s the kind of festival that anyone can participate in, whether you’re in India or here in Australia. Festival of Lights is a sincere effort to bring the Indian& other communities together to celebrate the joyous festival of Deepavali with fervour and gaiety. Deepavali Carnival 2017 are also a great way to showcase traditional Hindu culture to the new generation. It will help them understand and witness the origins of the most glorious Indian festival. A Spectacular Indian festival of lights showcasing Indian, Nepalese, Bhutanese, Bangladeshi, Indonesian, Tibetan &Fijian traditions, food, cultures, dances. and much more (surprise elements). It will be celebrated at Adelaide Showgrounds with the wider communities. The event is for everyone to enjoy the rich cultural heritage of the Indian and other communities. Premier Tickets is Australia’s leading online event ticketing & marketing solution provider. We act as a channel between the event organizers and end customers helping our clients with hassle free event ticket booking, event marketing & promotion solutions. Contact us for any of your ticketing & marketing needs for Deepavali Carnival 2017.